Perfect fit under carpets, up walls, and even behind furniture. Easily between cramped spaces improving the look of your home or office. Designed to mount in various face plates/surfaces. These cables offer a clean and convenient connection to your RJ45 Ethernet network. Designed to optimize the space in telecommunication room and data center. Protect your high speed network from noise and electromagnetic interference when you connect with our shielded Cat6 patch cable. Ideal for residential / business outdoor network installation such as patio. Designed to connect two devices such as computers, game machines directly. Allowing the devices to bypass the hub or switch. Perfect for connecting two devices such as computers, game machines directly. Allowing the devices to bypass the hub or switch. Cat6 ethernet cables are cable of support high bandwidth and can handle up to 1 gigabit speed. It also has stricter guidelines for crosstalk and hence provides more interference free connection than it’s predecessor. SF Cable has a variety of Cat6 cables. Our collections includes Cat6 Crossover Patch Cables, Cat6 Flat Patch Cables, Cat6 Patch Cables Booted, Cat6 Patch Cables Non-Booted, Cat6 Shielded Crossover Cables, Cat6 Shielded Patch Cables, Cat6 UTP Slim Booted Cables and Industrial Outdoor Cat6 SSTP Cables. Our Cat6 cables come in various colors and lengths. SF Cable is a one stop solution for all your network cable requirements. We provide high quality Cat6 cables at low prices by sourcing them directly from ISO 9001:2000 certified manufacturers. We have a 60 days money back policy for all cables and provide lifetime technical support for these cables. CAT 6 Ethernet Cable has been created to handle Gigabit speeds in the best way. It can also be optimized for 10-Gigabit usage. As CAT 6 Cables have stricter specifications for crosstalk and system noise as compared to Cat 5 cables. So there are very few chances of errors. CAT 6 cable costs certainly more than CAT 5 Cables but if you are building your network from the scratch and want to have an updated system for future purposes, buying a Cat 6 cables from SF Cable is always a good choice! 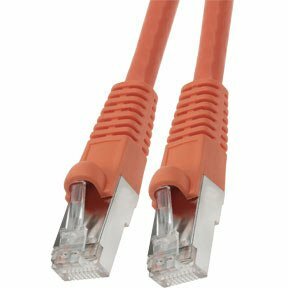 How Do Cat 6 Ethernet Cables Work? CAT6 cables are built to support Gigabit Ethernet data rates of 1 gigabit per second. They have four pairs of copper wire and utilize the pairs for signaling and offering good quality performance. The ends of a CAT 6 cables make use of RJ-45 standard connector just like the previous versions of Ethernet cables. Category 6 Augmented - CAT 6A cables were created to enhance the performance of CAT 6 Ethernet cables. They support up to 10 Gbps speeds. By using CAT6A cables you can enable 10 Gigabit Ethernet data to run up to 328 feet, which is twice as far as CAT 6. However, it only covers distance of up to 164 feet. As CAT 6A cables provide with higher performance, they cost more than their CAT6 cables and look thicker. They also make use of the standard RJ-45 connectors. You can buy both CAT6 and CAT6A cables at cost-effective prices from SF Cable!